Since 1978, NiTEC have been committed to research and development in the field of metal plating. In recent years, we have developed a new and exciting innovation within the engineering industry, SeaTEC100. SeaTEC100 can extend the life of mild steel operating in marine environments. It is also a very cost effective way of doing so. Developed and tested by our specialist team at NiTEC, this product is able to protect mild steel from salt spray corrosion for an unprecedented length of time. Perfect for use in sub-sea conditions, SeaTEC100 increases the strength of items such as pipeline connectors, where the material is at its weakest level. SeaTEC100 can effectively plate metal components, valves and connectors, making it a cost-effective and efficient way of extending the life of mild-steel used in marine environments. It is also the ideal plating for oil rigs and pipes used to transport oil and gas. SeaTEC100 has also been tested to withstand salt spray conditions for over 25,000 hours, longer than any other coating has been tested for within the industry with positive results. To find out more about SeaTEC100 and NiTEC’s electroless nickel plating capabilities, please visit our website. Anti-biotic resistant superbugs such as MRSA are an enormous public health problem as they spread so easily around hospitals. In fact, an estimated 7 million people worldwide catch healthcare-associated infections each year. But there is a way to combat this, and it’s not the solution you’d be inclined to jump to. Forget anti-biotics or cleaning products, copper plated surfaces actually have the natural ability to kill bacteria on contact. Here at NiTEC, we make habit of keeping a close eye on the research and experimentation surrounding the use of copper surfaces in the medical industry. Copper is often used to plate laboratory and medical equipment in hospitals, which is why we launched our new service copper plating medical clipboards for use in hospitals. With the evidence for copper killing bacteria on contact mounting, we are confident that our service of copper plating medical clipboards is the logical solution to preventing the spread of infection and superbugs such a MRSA in hospitals. Bill Keevil, of the University of Southhampton recently carried out an experiment which would test the theory that copper could be a very effective way of combating anti-biotic resistant superbugs. The live experiment took place on World Health Day and involved Keevil sterilising copper and stainless steel plates, and then coating them with 10 million MRSA cells. The plates were placed under a microscope and the results recorded. The MRSA on the stainless steel surface thrived, but amazingly, the MRSA on the copper surface began to die off. Bill Keevil understandably believes that copper and copper alloys should be used on contact surfaces around hospitals such as door handles for example. In our ongoing effort to develop our metal plating services and keep up to date with advances in the industry, we have recently expanded our copper plating services. As specialists in the process of copper plating, NiTEC have launched a new service copper plating clipboards for use in hospitals. Hospital-acquired infections are not only very common, but also very costly to the NHS. And recent research by carried out by the University of Southampton has shown that metallic copper surfaces kill microbes in minutes by causing significant membrane damage to the bacteria. Copper has been proven to prevent the horizontal gene transfer in bacteria, which is to blame for antibiotic resistance, in turn increasing the number of health care associated infections. Horizontal gene transfer commonly takes place in hospitals on surface that are frequently touched. Copper plating contributes to the prevention of infection spread and gene transfer. “Copper plated clip boards are a logical step forward in the quest to reduce the spread of bacteria and provide extra protection alongside the standard hygiene practices in the hospital environment,” said Marcus. Here at NiTEC, our heat treatments services can be used for stress relieving and de-embrittlement as both pre-plate and post-plate treatments. We often heat treat metals in order to increase their strength and wear resistance. We also offer high temperature heat treatment solutions for sustained periods, which are used to diffuse the electroless nickel layer into the steel, which gives flexibility to the coating. This process does not affect the increased corrosion protection offered by this type of deposit. Heat treatment refers to the controlled heating of metals in order to alter their properties without changing their shape. From the heat treatment of specialist nickel alloy grades, to stress relieving of mild steel fabrications, the heat treatment services at NiTEC are monitored to ensure the highest quality. 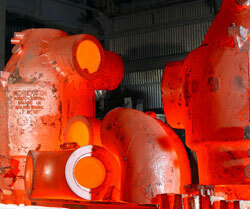 The heat treatment facility at NiTEC has furnaces with ranges of 0 – 700°C. Furnace 1 has dimensions of 1.5m x 1.5m x 2m high, and furnace 2 has dimensions of 1.7m x 1.7m x 2.2m high. The staff at NiTEC use chart recording equipment to monitor the temperature changes of both the furnace and the work. This enables us to create heat treatment profiles which determine shotblasting solutions for many different requirements. Our monitoring also ensures the material achieves the required temperature for the required time, in turn eliminating heat sinks on larger components or mixed loads. Small components can be loaded onto shelves to maximise the heat treatment capacity and minimise the cost of the treatment for our customers. NiTEC have recently had the pleasure of nickel plating a number of benches for the English designer Thomas Heatherwick. 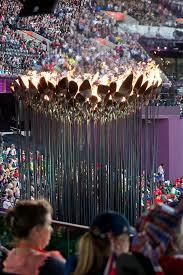 Known for his innovative designs and creative use of engineering and materials to produce public monuments and sculptures, Heatherwick was asked to design the Olympic Cauldron used at the London 2012 opening and closing ceremonies. Famed for his adventurous and original use of manufacturing processes and materials across the disciplines of architecture, art and design, Thomas Heatherwick is also renowned for his innovative ideas at the forefront of manufacturing and design practice. Thomas Heatherwick’s extruded benches began life in Heatherwick’s design and architecture studio when working on a project that involved manufacturing aluminium components through an industrial process called extrusion. The process of extrusion involves squeezing heated metal through a shaped hole which is known as die. The heated metal produces straight aluminium lengths in this way, with a precisely shaped cross section. However, extrusion is liable to produce very contorted shapes when the metal initially squeezes through the die. This is because the metal becomes snagged and warped as it struggles to fit. The form eventually straightens out and usually during this process; the contorted end is chopped off and melted back down. However, Thomas Heatherwick considered the mutated sections to be more interesting by far than the straight parts, and set out to produce more warped lengths of extruded aluminium on a much larger scale. The designer then wondered if it would be possible to use the extrusion process to create seating, much of which was needed at the time to furnish new airports and stations being built around the world. Heatherwick saw it as a simple but effective alternative to ordinary furniture that had to made up of several components and materials. These extruded seats could be made all in one go, with the legs and back of the seat formed all at once. The Heatherwick studio hunted for a machine capable of making this dream a reality for more than 16 years, until they finally came across a new extrusion machine that had been built in the Far East. The machine was designed for use in the aerospace industry and had the capability of exerting ten thousand tonnes of pressure. The factory it came from could not actually guarantee the outcome of the experiment because the machine had never been used to its full capacity. Using this specialised die, Heatherwick and his studio staff made a series of aluminium benches with straight, extruded lengths, and contrasting raw, contorted ends. The sweeping parallel lines created through the extrusion process are contorted into random, gnarled endings and the arbitrary swirling forms of the bench are created through the initiation and termination of the extrusion process. NiTEC were asked to nickel plate the benches to provide a high quality surface that would be very resistant to wear. To view these benches, please click here to visit the Heatherwick studio website. Heatherwick’s projects take the design process to its broadest reaches, from entire buildings to handbags, bridges to furniture, and always involve a radical approach to manufacturing processes and use of materials. Heatherwick is now working on more commercial products using this process to create components for architectural construction, facade design and mass produced seating ranges. Shot blasting is a great way of cleaning all types of metal. The process of shot blasting will move grease, paint, rust, plastic, rubber insets and paint adhesive, making it perfect for the restoration of classic cars, garden furniture and steel window frames. 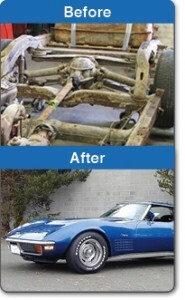 By removing these substances from the surface of the metal, it is then ready to be restored. We recently had the pleasure of shot blasting the chassis of a 1965 Corvette Stingray brought in by a customer from Nottingham. We were able to carefully remove all the remaining paint and build up of corrosion using shot blasting, as the chassis itself was very badly corroded and needed a lot of repair work. The customer has now rebuilt the car to restore its former glory. Here at NiTEC, we pride ourselves on our excellent chilled iron shot-blasting services. We have the ability to shot blast components of up to 20 tonnes in weight, and the capacity to shot blast components of up to 216m³. Our stainless steel booth minimises the levels of particles which settle on the work and we also offer the service of blasting with aluminium oxide 180-220 grit, which produces a very fine surface finish. If you have a current restoration or repair project and would like more information about shot blasting, please visit the Nitec website. NiTEC are pleased to announce that we are now Sustaining Members of the Institute of Metal Finishing. The Institute of Metal Finishing is an internationally recognised body with expert knowledge on all areas of metal finishing, coating and surface engineering technologies. It’s great to have access to the services and benefits that the Institute offers, and in turn be able to add value to our own services, the benefits of which we can pass on to our customers. As a Sustaining Member, NiTEC have the privilege of receiving up to the minute information on the latest technical developments in the sector, and get all the latest information about forthcoming legislation on health, safety and environmental issues, as well as events of interest to the metal finishing industry. NiTEC also now have access to the latest technical information through the Institute of Materials Finishing journal transactions and its newsletter IMFormation, and we also have access to the technical inquiry service which engages us in contact with industry experts and consultants. We also have the opportunity to enroll our staff on further Education and Training courses, ranging from basic surface finishing theory and practice, to those leading to nationally recognised qualifications. NiTEC’s Sustaining Membership of the Institute ensures we are making a positive commitment to the long term sustainability of the industry as well as ensuring that the views of our industry are presented to Government and to the EU. Our membership also supports the recognition of metal finishing and surface engineering as important sectors of manufacturing in UKPLC. Here at NiTEC, we have over 30 years experience specialising in the electroless nickel plating process, and we have developed a comprehensive range of metal finishing processes and techniques. Our equipment and experience enable us to process all ferrous substrates, including plating stainless steel, copper and its alloys, and aluminium alloys. To find out more about the range of metal finishes that we offer including electroless nickel plating, diffused nickel plating, copper plating, shotblasting or heat treatment, visit the NiTEC website for more information, call us on 0845 224 3571, or email us at info@nitec-enp.co.uk. Electroplating is a process that uses an electrical current to dissolve metal so that a metal coating is deposited on an electrode. This process is called electrodeposition. The part that is to be plated is called the cathode and the anode is made of the metal which is to be plated onto the component. The parts to be plated are then placed in a solution called an electrolyte, which contains metal salts and ions which allow the electricity to flow through it. The power supply then directs the current to the anode, which oxidises the metal atoms that comprise it and allows them to dissolve in the solution. Then, the dissolved metal ions plate onto the cathode from the electrolyte solution. 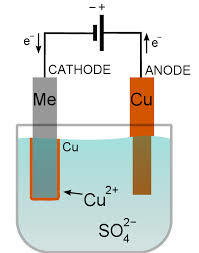 The rate at which the cathode is plated is always equal to the rate that the anode is dissolved. What is electroplating used for? 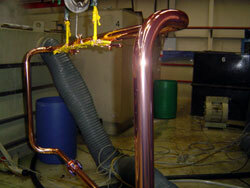 Electroplating is used to change the surface properties of an object. For example, electroplating may be used to build up the thickness on a part that is slightly undersized, or to form objects by electroforming. Electroplating may also be used where abrasion, wear resistance, and corrosion protection are an issue, to increase lubricity and for aesthetic purposes. Unlike electroless nickel plating however, the process of electroplating makes the component subject to changes in the density of the current. This results in variations in the thickness of the electroplated deposit. Electroless nickel plating is an auto-catalytic reaction which is used to deposit a coating of nickel on a substrate. The metal is deposited when a reducing agent reacts with metal ions. Unlike electroplating, it is not necessary to pass an electric current through the solution to form a deposit. What are the advantages of electroless nickel plating over electroplating? Electroless nickel plating has a completely uniform coating. This means that it is a perfect solution for critical high-end engineering items including defense, healthcare, automotive and aerospace. Electroless nickel can be deposited to produce a wide range of coating thicknesses, with uniformity and minimum variation from point to point. This uniformity can be maintained in plating both large and small parts and on components that are fairly complex, with recessed areas. Electroplating of such parts, on the other hand, would produce thickness variation and possible voids in the plating when coating holes and inside diameters. Also, with the proper pre-plate catalyst, electroless nickel plating can deposit on non-conductive surfaces. What is electroless nickel plating used for? Electroless nickel plating is a plating technique commonly used to prevent corrosion and wear. The electroless nickel plating process is a high quality, cost effective solution to coating metals such as mild steel or stainless steel and can substantially extend the life of a component. Electroless nickel plating is extremely resistant to corrosion and will therefore extend the life of everything it coats. This makes it ideal for coating parts exposed to harsh environments such as those operating in the marine, oil and gas and defense industries. Therefore, it can also reduce the cost of repair and replacement parts. Here at NiTEC, we know that no other metal coating has the fantastic combination of properties offered by electroless nickel. Here are 7 great reasons to choose electroless nickel plating! For more information about electroless nickel plating and more great reasons to choose nickel as your plating material, visit the NiTEC website, become a fan of our Facebook page, or why not follow us on Twitter? NiTEC are proud to announce our latest ISO 14001:2004 certification! Here at NiTEC, we operate a Quality Management System which complies with the requirements of ISO 14001:2004 for the application of electroplating and electroless plating and associated metal treatment processes. At NiTEC, quality and service are of vital importance. We are committed to following our Quality Assurance Programme which is outlined in our Quality Manual, in accordance with the requirements of BS EN ISO 14001:2004. 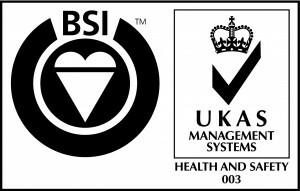 ISO 14001:2004 certification means that the quality management system at NiTEC has been recognised globally. All employees at NiTEC are responsible for implementing the recommendations outlined in the Quality Manual. These standards of quality are applicable to all of their activities and they are responsible for achieving the specified quality levels at all stages of work. NiTEC is comprehensively equipped for all aspects of quality control and product testing. We also have the ability to carry out non destructive testing for thickness and hardness, in order to ensure the highest levels of quality and accuracy at all times. To find out more about the range of quality metal finishes that we offer including electroless nickel plating, diffused nickel plating, copper plating, shotblasting or heat treatment, visit the NiTEC website for more information, call us on 0845 224 3571, or email us at info@nitec-enp.co.uk.